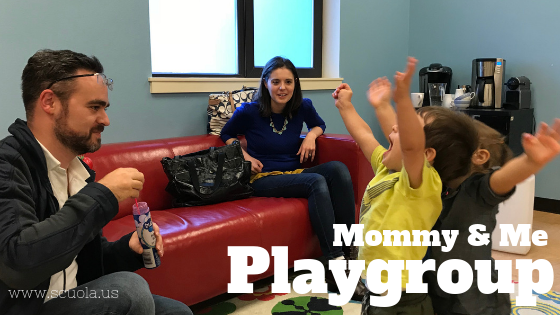 Beginning September 14, 2018 Mommy and Me Playgroup is from 10:00 a.m. to 12:00 a.m. every Friday. You can also view our calendar for exact days that Mommy and Me will be held. It is never too early to share a second language with a child. In fact, there are many wonderful benefits to learning a second language at a young age. Studies show that children who learn a second language early are more likely to develop native-like fluency. Children also experience better overall school performance and enhanced problem solving skills. Additionally, children develop stronger communication skills with foreign language exposure. Led by a native Italian teacher, Io e la Mamma is designed to engage children ages newborn – 4 years old and a parent or caregiver with simple language immersion through games, music, crafts, free play and other activities. Io e la Mamma is held on most Friday mornings from 10:00 to 12:00 am at Friendly House in the Pearl, located at 1542 NW 14th Ave (between Quimby and Raleigh Streets). We encourage participants to sign up for email notifications and to RSVP for play sessions. Although an RSVP is not required, it does help the instructor prepare sufficient materials for the group.